The first surprise is that there is absolutely no packing or obfuscation of the binary, it decompiles cleanly in IDA. 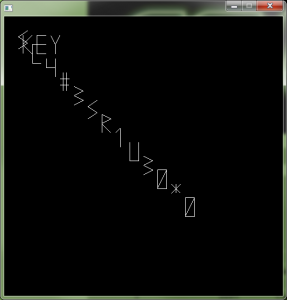 What we see is that it's a classic OpenGL application with OpenGL init and a frame loop. I used to be a demoscene coder that wrote his own 3D engine so this looked very familiar. glIntercept comes with a replacement DLL that will be loaded by the binary when initializing OpenGL. At the end of the frame drawing, we draw a huge rectangle all over the screen in white. At this point we see now a black background, "KEY" written in white lines and many letters written in vectors randomly moving on the screen. We are on the right way. Now we need to remove the randomness in the key letters placement and put them next to each others so we can read the flag. Since the positionning sub is the same for all the letter, I choose to use the space previously allocated to the rand() calculation to write my new opcodes. Also to avoid having to patch all the other sub functions drawing letter that do a glPopMatrix, we will just put a glPushMatrix at the end of the positioning function, this way the result is neutral. This challenge was really fun to do and original.